The next Frogs of the World Photographic Workshop to be held at LifeLike Imaging in Mississauga, Ontario has been scheduled!. Saturday, February 16, 2019 10:00a.m. - 3:00 p.m. The space for this workshop is limited to a maximum of 8 participants ( SOLD OUT ) to allow ample time for folks to photograph each species of frog. 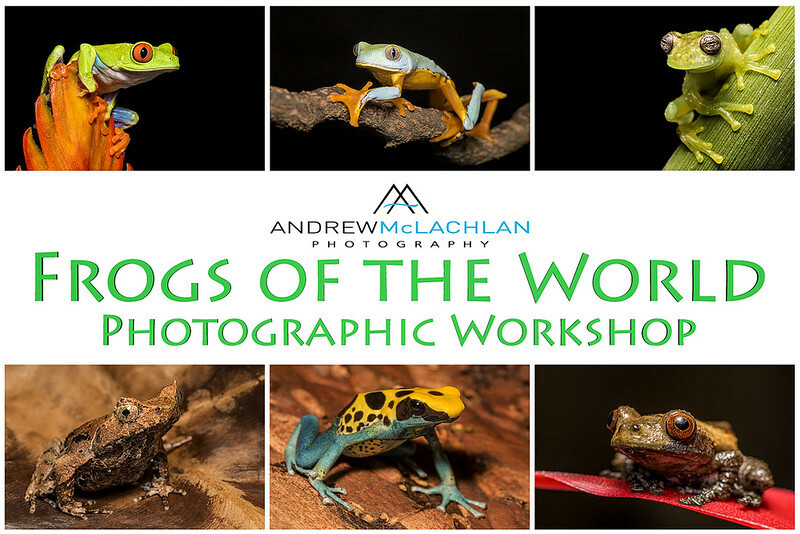 These are the only workshops available whereby you will be able to capture stunning imagery of 15 - 20 different species of frogs from all over the world. We will be photographing numerous varieties of dart frogs endemic to the Amazon rainforest, and several tree frogs of Costa Rica and South America. It would cost tens of thousands of dollars to explore the jungles of the world, with hired guides, on your own in hopes of photographing a mere fraction of these species. These workshops, in partnership with Understory Enterprises, will bring you an incredible opportunity to photograph these 15 - 20 species of frogs in a comfortable atmosphere with natural studio set-ups. The recommended gear for photographing these tiny frogs is a macro lens and off camera flash. Alternately, using high quality close-up filters such as the Canon 500D filters will allow many lenses such as the Nikon 80-400mm or Canon 100-400mm to focus close enough for these small subjects. Please contact me here if you have any equipment inquiries when registering for this workshop. I also have custom made flash diffusers that will allow folks to capture stunning imagery using camera mounted flash as well. Coffee, tea and snacks will be provided during the workshop. To register for this workshop contact me by clicking here . Payments can be made via email transfer or by cheque made payable to Andrew McLachlan. The cost of the workshop is $195 CDN plus taxes.